On Friday, we released an update that finalizes our integration with Perfect Places. You can now create a calendar sync for Perfect Places and we'll automatically make sure your bookings show up there. There is a slight delay in the integration so new bookings and blocked-off times may take a few hours to show up in Perfect Places. It shouldn't take more than 24 hours. Since our support area is still being built, here is some info to get you started. To add a sync for Perfect Places, navigate to your property and select the Calendar Sync link. On the Calendar Sync page, you'll notice that a new sync appears for Perfect Places. Click the Set Up Now button and you'll see a new calendar sync page that asks for a Reference Number and has a set of Save/Cancel buttons. In order to save the new sync, you must supply a reference number which is the number that shows on your Perfect Places listing. 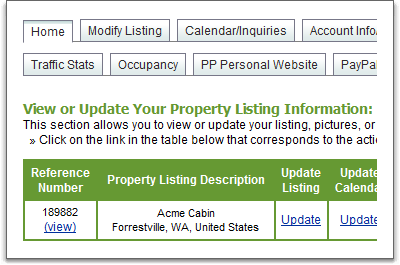 Log into the Perfect Places control panel and look at your listings. The reference number is shown in the left-most column. After you've copied the reference number over, click the Add Sync button and we'll take care of the rest. After you add the sync the first time, a representative from Perfect Places may contact you by email to verify the integration. You'll never need to manually update your Perfect Places calendar again!